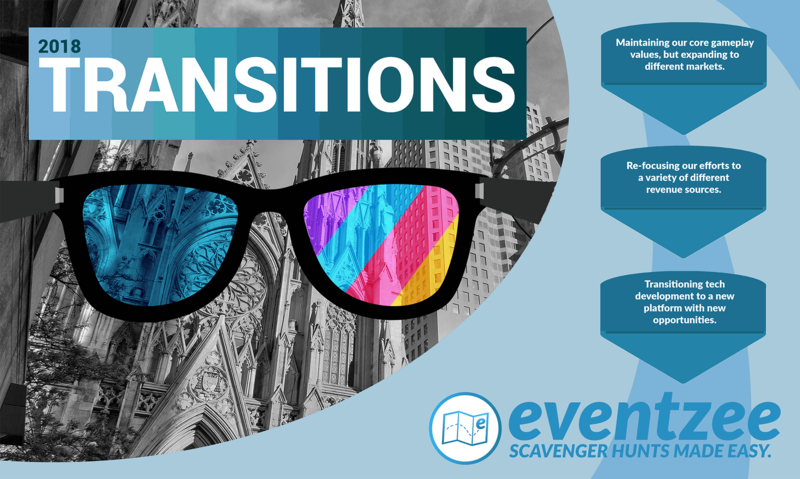 As we announced in Eventzee’s Year In Review post, 2018 is a year of Transitions. With that in mind we’re excited to promote our sister app ZeeTours’ new Contest feature- which you can join NOW in the ZeeTours app. As a quick refresher, ZeeTours is a self-guided City Tour app that combines fitness, learning and fun into an unforgettable experience. Follow the tour path to a variety of points of interest, solve clues to complete challenges, and learn more about the city around you. Currently ZeeTours has a handful of tours in American cities, but we wanted to give international players a chance to join in the fun- that’s where the Contests come in. Similar to Eventzee’s former Premium Hunt platform, these pay-to-play Contests allow players from around the world to compete for prizes by completing themed Trivia and Photo Challenges. A new Contest is held each week starting on Wednesdays and running through Mondays. Each Contest includes a wide variety of Trivia and Photo challenges based on a weekly theme. As players complete Challenges they will earn points and a spot on the leaderboard. The top three winners from each Contest will then be awarded prizes.The prizes will vary from week to week, but could be Freeze Tag Inc gift cards, Amazon gift cards, etc. Although ZeeTours has some similar features, there are a few notable differences that will make this a bit different of an experience from what Eventzee players are used to. We think you’ll all have a great time, but here’s a quick rundown of some of the differences. Unlike Eventzee’s list of clues being released all at once, in ZeeTours you’ll have to complete each Challenge one by one to advance to the next task. ZeeTours Contests put a big focus on Trivia Challenges. Similar to Eventzee you’ll lose points if you answer incorrectly, but there is also a speed bonus for answering correctly quickly. In its current iteration ZeeTours Contests are broken into mini themed sets of Challenges. Unlike Eventzee there is no ongoing review process with ZeeTours Contests. At the end of the Contest the top three players will have their photos reviewed to make sure there are no clear cheaters. Because of this players will have the length of the Contest to complete challenges and upload photos, but will not be able to resubmit their photos if they are declined. In the event a cheater is identified, their Challenge will receive zero points and a new player will take their spot on the leaderboard. In other ZeeTours news, we have also released tours in an additional five American cities with another four tours going live on Friday, February 2nd. All tours are available for purchase at www.zeetoursapp.com, in the mobile app via in-app purchase and through the Groupon app and website. Thank you all for your continued support of both Eventzee and ZeeTours! Be sure to join this weekend’s ZeeTours Contest as well as our usual Weekend Warriors free photo scavenger hunt, which goes live Thursday at 3 PM CST. In 2017 Eventzee stayed the course, and maintained our current client base while adding efficiency behind the scenes. * Although there may not have been many feature heavy updates, our focus for the year was optimizing how we do business to make our experience more efficient for both the customer and our staff. We’re thankful to all of our clients and particularly our partners who have continued to do business with us multiple times over the years. With a new year comes new challenges and opportunities. In 2018 our focus and theme of the year will be “Transitions.” We plan on maintaining our core gameplay values, but also expanding our focuses into new markets and revenue sources. The first step in this process was the development and release of our new app ZeeTours- a Zany Walking Tour Adventure. ZeeTours take you on an adventure in the real world, using similar gameplay mechanics as Eventzee. ZeeTours is a location-based smartphone game that combines fitness, learning and fun into an unforgettable experience. Follow the tour path to a variety of points of interest, solve clues to complete challenges, and learn more about the city around you. To purchase a tour voucher code just visit ZeeToursApp.com or download the app to your Apple or Android device. ZeeTours are currently available in nine cities with plans to expand to more at the beginning of 2018. While Eventzee has always been focused on event based scavenger hunts, ZeeTours gives us the opportunity to reach new communities via an updated platform. The development of ZeeTours has also given us the opportunity to develop the Eventzee program in the near future. What exactly this development will look like is still to be determined, but we have lots of plans we hope to bring to fruition in 2018. So as we begin transitioning to this new platform we want to thank all of our players and clients for their patience and support for nearly 3 years. We’ve got new and exciting things on the horizon and we’re ready for the transition! 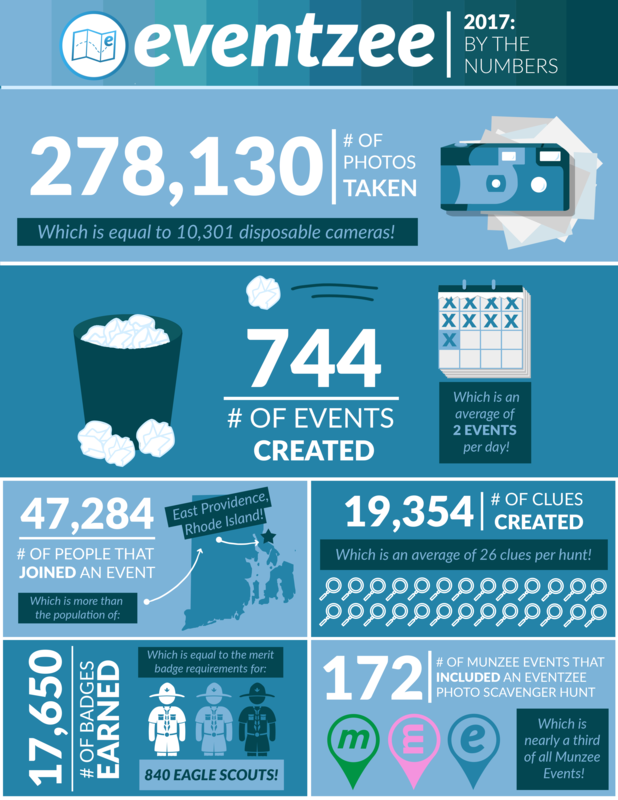 *Check out the infographic below to see some fun stats about Eventzee’s 2017! We have released a new update which changes the ways you can join hunts, so just use the code “WW144” after you login. #ThrowbackThursday – Share your favorite past pic from 2017! Auld Lang Syne – Ring in the New Year singing a song of friendship for old time’s sake. Ball Drop – Creatively represent the NYE ball drop in New York City. Best Foot Forward – Take a picture stepping through your doorway. Bright Lights In The Sky – Creatively represent fireworks bringing in the new year! Calendar Collection – Take a photo of a 2017 calendar before throwing it out. Cheers! – Share a traditional New Year’s drink with a loved one. Family Game Night – Take a photo playing your favorite board game with your family and/or friends. I-Spy – C – Find the letter “C” formed in architecture, nature, etc. Lucky Food – Snap a picture enjoying a common New Year’s tradition of eating 12 grapes. Mail Time – Take a photo of a unique mail box. Make Some Noise – Scare away bad luck with loud noises. Show us how you make noise! New Year’s Resolution – Creatively represent your New Year’s resolution. Party Hardy – Take a photo of a bar or restaurant advertising a New Year’s eve party or celebration. Silver and Gold – Take a picture of something metallic. We have released a new update which changes the ways you can join hunts, so just use the code “WW143” after you login. #ThrowbackThursday – Share a picture of the most popular toy the year you were born. Be sure to include the year in the picture. 8 Days a Week – Take a picture at a store that advertises being open every day of the week. Bah Humbug – Creatively represent acting like Ebenezer Scrooge. Below Freezing – Take a photo of a thermometer that’s below 32 degrees (0 degrees Celsius). Warm where you are? Get creative! Caught Under the Mistletoe – Give someone a smooch under this festive bouquet. Dodgy Jumper – Take a picture in your best ugly sweater. Evergreen Holiday – Find a spruce or fir tree in nature. Hit The Snow – Creatively represent sledding down a big hill. I-Spy – B – Find the letter “B” formed in architecture, nature, etc. Jingle Bell Rock – Creatively represent “rocking around a Christmas tree”. On Dasher! On Dancer! – Santa needs to hire a new reindeer to help carry all the gifts. Creatively represent who the new reindeer will be. Parcel Package – Take a picture of a unique book bag. Santa’s Treats – What late night snack would you like to be greeted with if you were Santa delivering presents? Shimmy Down the Chimney – Creatively represent coming down the chimney like Ol’ Saint Nick. Special Snowflake – Fold some paper and craft your own unique snowflake. POP QUIZ! Summer break has come to an end and school’s back in session! All work and no play makes for some worn our students though, so we’ve put together a premium hunt to make the first week back to school a memorable one- even if you aren’t a student anymore! This Premium Eventzee Scavenger Hunt will run Monday August 29th at 3 PM CST until Thursday September 1st at 3 PM CST. To join the hunt, go to the following link. Be sure to include your username in the correct field as well. The cost to join the hunt is $5. The price will remain the same until the hunt ends. By just joining the hunt you will earn the special “University of Eventzee: Class of 2016” badge! By completing the hunt you will also be put into a drawing for one of three Munzee gift cards! Good luck and successful studies! Earn this exclusive badge, just for joining the hunt! 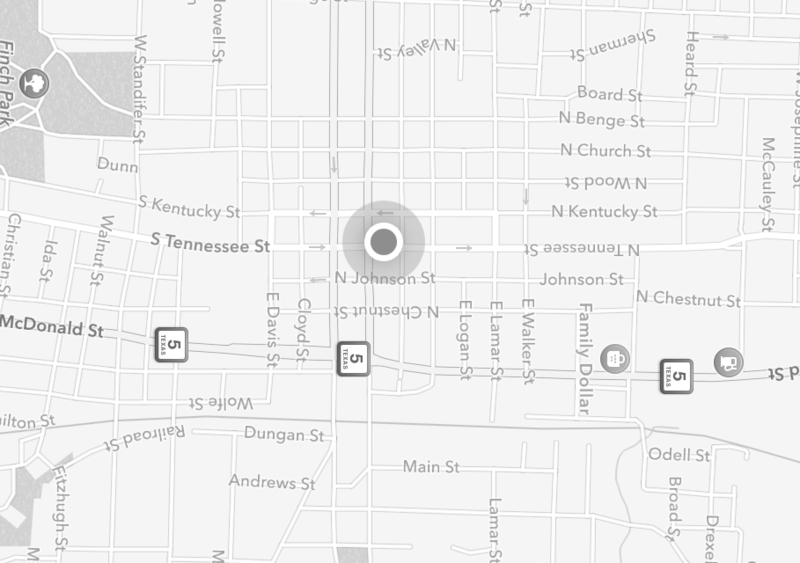 Eventzee Premium Hunt #3: Christmas In July! 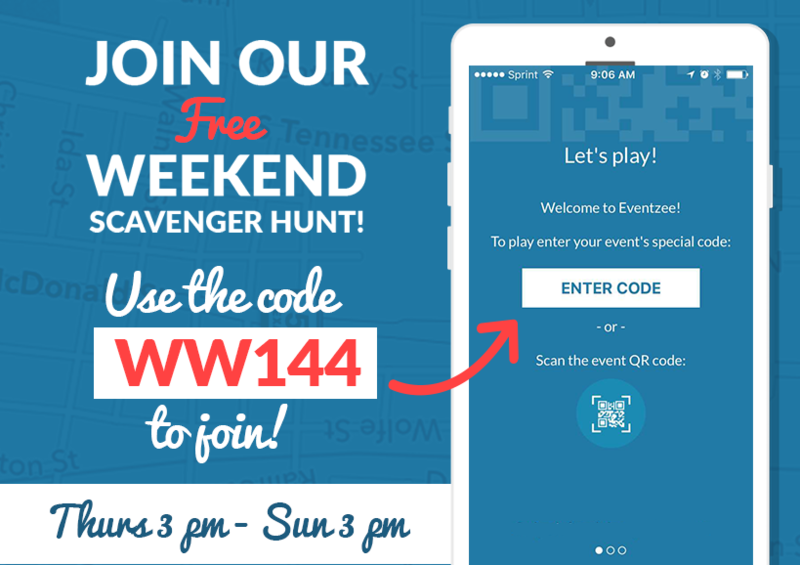 We are excited to announce a brand new Premium Eventzee Photo Scavenger Hunt! Sleigh bells are ringing for this themed hunt because we’re celebrating “Christmas in July”! Santa may be in the middle of his summer vacation, but our players can still celebrate decorating the palm tree and exchanging ugly christmas Hawaiian shirts. The hunt will begin Monday July 25th at 10 AM CST and will run until Thursday July 28th at 10 AM CST. The cost to join the hunt is $5 until Monday at 10 AM CST, then the price will increase to $6 for the rest of the hunt. 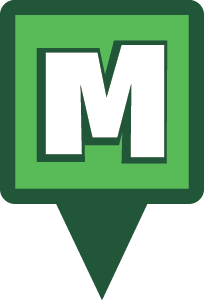 Once you have paid be sure to input your Eventzee/Munzee username so you can be manually added to the exclusive hunt. Just for participating you’ll receive an exclusive “Skinny Dipping Santa” badge! Completing the entire hunt will also put you in a drawing for one of three Munzee gift cards! While you’ll still get badges for placing first, second and third, the real winners are anyone who can complete all of the clues!